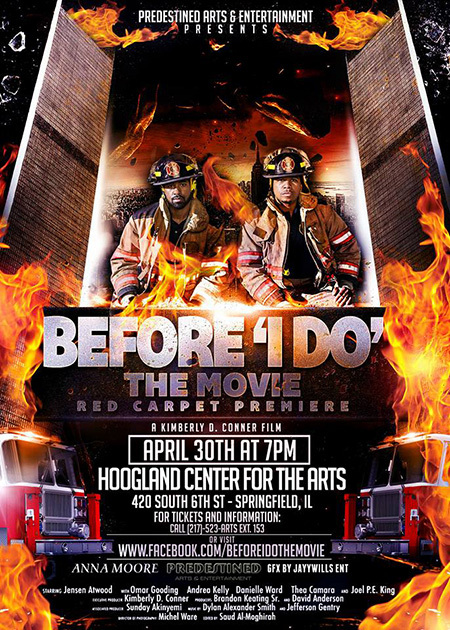 “Sold out” is one of the operative phrases for the debut of the downstate Illinois film production BEFORE ‘I DO,’ set to enthrall a full house starting at 7 p.m. tonight, Saturday, April 30, at the Hoogland Center for the Arts, 420 S. Sixth St., Springfield, IL, in the main auditorium. Director, writer, and executive producer Kimberly D. Conner will introduce her newest big-screen story at the premiere, following a year-and-a-half-long post production stretch during which her freshman feature effort, JUMP IN, received national distribution. In the past two weeks leading up to show time, Conner graciously engaged C-U Blogfidential in an e-mail exchange about all things ‘I DO’ and Predestined Arts & Entertainment, the media studio she co-founded with sister Candice, and we’d like to share a few highlights with you! A second show has been set for May 28 at the Plaza Theatre in Atlanta, Georgia, with many more certain to follow including, we hope, a local reprise for those who will not descend upon the Hoogland Center this evening. You can keep up with the progress of BEFORE ‘I DO’ by frequenting its Facebook page or checking in on its official Web site; once we receive concrete information on close-to-home developments, we’ll post them for you and watch the sparks fly! It simply warms our collective CUBlog heart to no end as we witness the tireless effort put towards a career in the cinema arts by this Capital City resident and Champaign native. Hurrah! p.s.2 Consider the mic dropped. p.s.3 That is, until the mic is picked back up and we continue our conversation with Conner in an upcoming article. Exercise those eagle eyes, dearest readers! This entry was posted on Saturday, April 30th, 2016 at 3:15 pm	and is filed under Alums Done Good, Central Ill. Commission, Public Events. You can follow any responses to this entry through the RSS 2.0 feed. Both comments and pings are currently closed.